Michael Bird, head of the British Council in Russia. UK-Russia year of Language and Literature announced. Cultural relations between Russia and the UK continue to be close and active. Just a year after the 2014 UK-Russia Cross-Cultural Year came to an end, unsurprisingly, 2016 has been designated a UK-Russia year of Language and Literature. The opening ceremony will be held in London's Royal Festival Hall on Feb. 25, 2016 with a live Philharmonia Orchestra concert screening of the classic 1927 silent movie Love, starring Great Garbo, which is based on Leo Tolstoy's classic novel Anna Karenina. "In the context of the current political and military crisis, a year of language and literature seems to be very important. It proves that culture and nations have a presumption of innocence," Mikhail Shvydkoy, the Russian President’s Special Representative for International Cultural Cooperation, said. Many events during the year will mark the 400th anniversary of William Shakespeare's death in 1616. Moscow's Tretyakov Gallery and London's National Portrait Galley will celebrate their 160th anniversaries next year with an exchange of masterpiece exhibitions in the spring. The British Council will lead the UK's Year of Language and Literature in Russia and the Russian Ministry of Foreign Affair will lead Russia's celebrations in the UK. "The 2016 Year of Language and Literature is a great opportunity for us to build on what we achieved in 2014 through the UK-Russia Year of Culture. 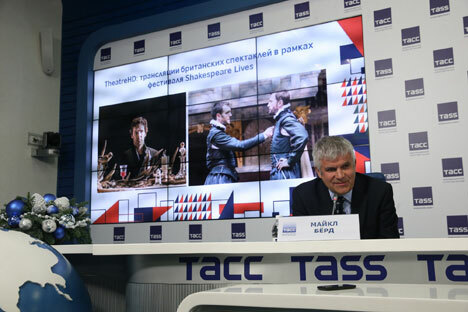 Shakespeare's anniversary will be commemorated around the world but nowhere will it have more resonance than in Russia, where Shakespeare, because of his influence on Russian writers, is practically a Russian writer himself," said Michael Bird, head of the British Council in Russia. He added that his personal acquaintance with Russia began many years ago with Chekhov's short story Lady with a dog. Online courses of Russian language for beginners and teachers, Olympiads for children, a Pushkin In Britain festival, poetry conferences, Russian writers' visit of the London Book Fair and a tour of Russian writers across the UK, are among the main events on the Russian agenda in Britain. Meanwhile Russia welcomes the 17th New British Film Festival, a literary summer in Yasnaya Polyana, a Shakespeare live festival, translators' competition and other events.